The near-silent Rotrex supercharger option is ideal for the Elise 111R and Elise S giving a smooth power delivery and highly refined driving experience. All components sit below the rear screen level in the Elise and Exige. These kits have been developed by Komo-Tec in Germany and are fully installed and tested by Hangar 111 in the UK. In a 1ZR-engined car (Elise 1.6, 2011 on), it delivers approx 195bhp and 159lb/ft. In a 1ZZ-engined car (Elise S), it delivers approx 215bhp and 182lb/ft. In a 2ZZ-engined car (111R, Exige), it delivers approx 260bhp and 184lb/ft of torque. Incorporating a front-mounted charge cooler, the Turbodrive kit runs at much lower temperatures to achieve its power, which reduces thermal stress on the engine, valves, and exhaust system. The kit significantly improves the power to weight ratio of the car and radically enhances the dynamics of the vehicle by removing the sudden ‘surge’ of the cam switch at 6200 rpm – instead delivering a smoother torque curve from 3000rpm up to the rev-limiter. This smooth characteristic is friendlier to drive through corners and makes the vehicle more predictable (and therefore safer) when applying the power. Remaps the original Lotus B-Type ECU – retaining all factory functions. Delivers significant increase in torque from 3000rpm. Achieves a smooth cam change at 4500rpm. 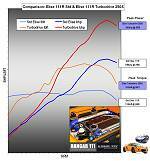 Places lower thermal load on the pistons and exhaust valves. Uses the same cam profiles as a non-turbo engine. Requires no engine block/cylinder head modification to achieve power. Maintains the vehicle dynamics that make it a Lotus! Graph not yet available. Graph not yet available. For latest pricing and availability of Turbodrive conversion please visit our online store or contact us. 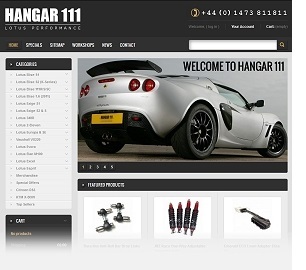 HANGAR 111 ARE THE EXCLUSIVE UK DISTRIBUTORS AND INSTALLERS OF KOMO-TEC PERFORMANCE KITS.